PM Netanyahu discusses Ariel-area terror attacks, says Hamas is responsible for unintentional rocket attacks. 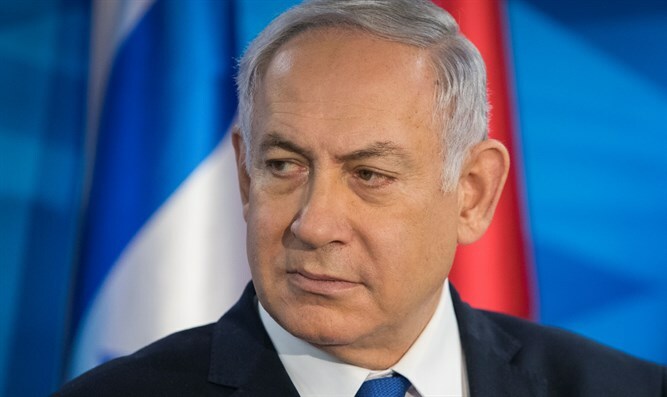 Israeli Prime Minister Binyamin Netanyahu on Sunday morning began the weekly Cabinet meeting by promising that the terrorists who carried out a double terror attack near Ariel would be apprehended. "We are in pursuit of the terrorists at two points in the Ariel area," Netanyahu said. "I offer my support to the soldiers of the IDF, Shabak (Israel Security Agency), and the security forces who are pursuing the terrorists." "I am certain that they will apprehend them and we will deal with them to the fullest extent of the law as we have done in all of the recent incidents." Netanyahu also discussed last week's rocket attacks on Tel Aviv. "Israel takes the rockets fired over the weekend from Gaza towards Israel very seriously," he said. "Hamas bears responsibility for any attacks from Gaza, whether those attacks are intentional or unintentional. I therefore ordered over 100 Hamas terror targets hit, and the IDF dealt them a severe blow." "If need be, we will intensify our attacks and do everything necessary in order to ensure quiet for Israel's citizens." Netanyahu also noted that "this week, US Secretary of State Mike Pompeo will arrive in Israel. I will discuss with him our efforts to prevent Iran's entrenchment in Syria, and most importantly, the efforts to prevent Iran from attaining nuclear weapons." "Together with Pompeo, I will meet Cypriot President Nicos Anastasiades and Greek Prime Minister Alexis Tsipras, in order to advance the laying of a gas pipeline from Israel to Europe. This will bring enormous revenue to the State, and it will be used for the benefit of Israel's citizens."